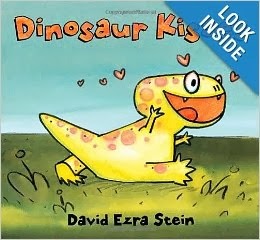 I recently received a few new V-Day related titles from Candlewick Press to share with you. Happy to do so! This title, perfectly themed for Valentine's Day (but good at any time of the year, really), is quite charming. The main message of Never Too Little to Love is that all things, no matter what their size, can be loved. 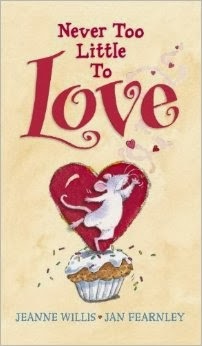 This book by Jeanne Willis features a mouse who is quite short and small but loves somebody "way up there." Mouse tries to reach way up high to give his love a kiss but he can't reach. As you turn the pages they shortened in length. This makes the book interesting from a visual perspective as you start by turning a full size page and then you are down to 1/2 a page length and then a 1/4 and so on and so forth. Each page shows Mouse trying to build up a ladder of items to help him reach his loved one but he is having some struggles along the way. In the end, he finds he cannot reach his love and so she has to bend down and give him a great big kiss instead. even if you are tiny . . .
you are never too little to love." Very cute book. The illustrations by Jan Fearnley help you to fall in love with the characters all the more quickly and the message is solid. I like it. In Dinosaur Kisses we meet Dinah, a newly hatched baby dinosaur. She's having a hard time learning how to express her love for others. She wants to be able to kiss another dinosaur but she can't figure out how to do it without WHOMP-ing and STOMP-ing them first. Eventually she figures out that she has to pucker up. If you look on goodreads you'll see lots of positive reviews for this one. As for myself, I'm not a terribly big fan. I get the idea: be gentle; learn to treat others kindly. That's all well and good. The problem is that I once witnessed a child (well, maybe more than one) who was full of WHOMP and STOMP, just as their mother(s) were full of excuses for their behavior. The world may indeed be an exciting place but some training is required to get through it and this book just ended up reminding me of the uncontrolled kids I've witnessed and that leaves me with a great distaste for it. Of the two, I find Never Too Little to Love to be the strong winner. I am delighted to say that Candlewick Press has offered to give a copy of Never Too Little to Love to one of my readers here at Reading to Know. Care to win? Simply leave a comment below. (PLEASE INCLUDE A VALID E-MAIL ADDRESS!) This contest will be open through Monday, February 17th. THIS CONTEST IS NOW CLOSED. THE WINNER, as selected by Random.org, IS #12 - Alison. Congrats! Many thanks to Candlewick Press who sent copies of these two books my direction in order to facilitate this review. I have received no additional compensation for this post and the opinions are 100% my own. How cute! I like the sound of how Never Too Little to Love is laid out with the page sizes changing. The pages changing sizes sound interesting! Thank you for the giveaway and the great blog. I always come here when I am looking for something new to read. Just requested Tea with Jane Austen from the library! !